From fast two-sided print speeds in vivid color to robust security, the HP Color LaserJet Pro M452dn will keep up with your active office. Because this HP laser printer uses real-time threat detection, you can be confident in the security of your prints. Conserve energy while you work, and secure your confidential materials with ease. Quickly connect while you're in the office using built-in Ethernet capabilities or print from your smartphone with Apple AirPrint, the HP Smart app, and more. FAST PRINTING, SOLID PROTECTION – Fast printing performance and security built for the way you work—this HP laser printer finishes jobs faster and delivers robust security to guard against threats. STAY CONNECTED WITH EASY MOBILE PRINTING OPTIONS – Keep your business nimble when needs shift or opportunity strikes—print in the office or on the go with the HP Smart app and more. LEGENDARY HP QUALITY – This HP color printer comes with laser technology, produces up to 600 x 600 dots per inch (dpi) standard, and is PANTONE calibrated. PERFECT FOR THE OFFICE – Get up to 28 pages per minute black or color. Recommended monthly volume of 750-4,000 pages. WIDE RANGE OF PAPER SUPPORT – This HP laser printer works with: Letter, legal, executive, Officio (8.5 x 13"); 3 x 5", 4 x 6", 5 x 8"; envelopes (No 10, Monarch). EASILY CONTROL YOUR LASER PRINTER – Manage tasks with the 2-line LCD screen, buttons, and LED indicator lights—plus, this HP laser printer wakes up to print faster than the competition. MORE PAGES, PERFORMANCE, PROTECTION – Bring out the best in your HP Color LaserJet Pro 452dn. Get reliable performance and outstanding quality using Original HP Toner cartridges with JetIntelligence. ORIGINAL HP TONER: This HP color printer uses Original HP 410A/410X black, cyan, magenta, and yellow toner cartridges. 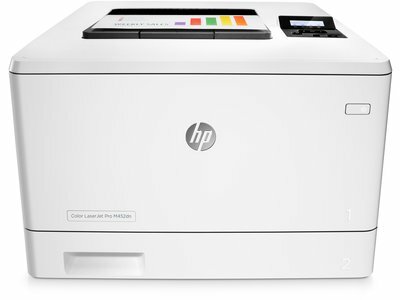 WHAT'S IN THE BOX – CF389A HP Color LaserJet Pro M452dn; 4 preinstalled introductory HP 410A LaserJet Toner cartridges; Getting Started Guide; Install Poster; Software CD; Power cord. Media Size A4 - 8.30" x 11.70"; Letter - 8.50" x 11"; Custom Size; B6 (JIS); Oficio; Photo - 4" x 6"; DL Envelope - 4.30" x 8.60"; B5 (JIS); A6 - 4.10" x 5.80"; Universal; A5 - 5.80" x 8.30"; 16K Envelope; B5 - 6.90" x 9.80"; C5 Envelope - 3.37" x 9"
HPclown: Just upgraded from inkjet to laser, like night and day performace. Not enough internal memory. Returning it. Reasonably priced, dang BLINKING light. Spencer123: Nice compact look for high quality printing. Haven't put it through the test yet, but the prints look great and the double sided prints work just fine. Biggest frustration is the bright blinking light for the on/off switch. Just part of the design. Only suggestion the forum group had was to put a piece of tape over the light. If you have a paper hole punch and some sort of dark sticker, that would cover it perfectly.